I don’t really like aubergines..I find them a faff to prepare..all that salting to get rid of the bitterness and I’m not keen on the texture of them either. So what do you do with two aubergines that turn up in your veg box? Well they sat in the fridge for a week while all around them all the other veg got eaten, until they looked very sad and lonely. I refuse to throw food away but knew if I made something like moussaka I wouldn’t want to eat it..and then when I was in the supermarket I saw jars of aubergine pesto on sale and thought ‘I could easily make that and the aubergine will be all chopped up so no texture issues..hurrah’. So earlier in the week, that’s what I did and it was nice with some pasta and rocket but it only used up one of the aubergines and with the addition of Parmesen cheese I did find it very rich. 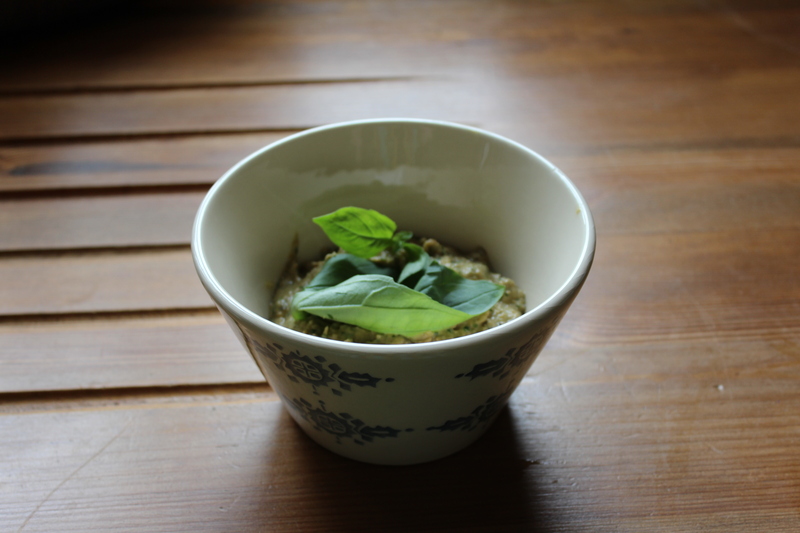 So this morning, with the remaining aubergine, I made a variation on the Pesto and here is my Lonely Aubergine Dip. It’s really scrummy and would taste great on it’s own or with fish. Chop the Aubergine into thick slices, brush with olive oil and grill for 10-15 mins until slightly charred. Put the slices into a food processor. Add 2 tsps of Dijon Mustard, juice of one lemon, half a bunch of basil, 2 cloves of garlic, one tbsp of Balsamic Vinegar, good glug of olive oil. Whizz it all together to your preferred texture. 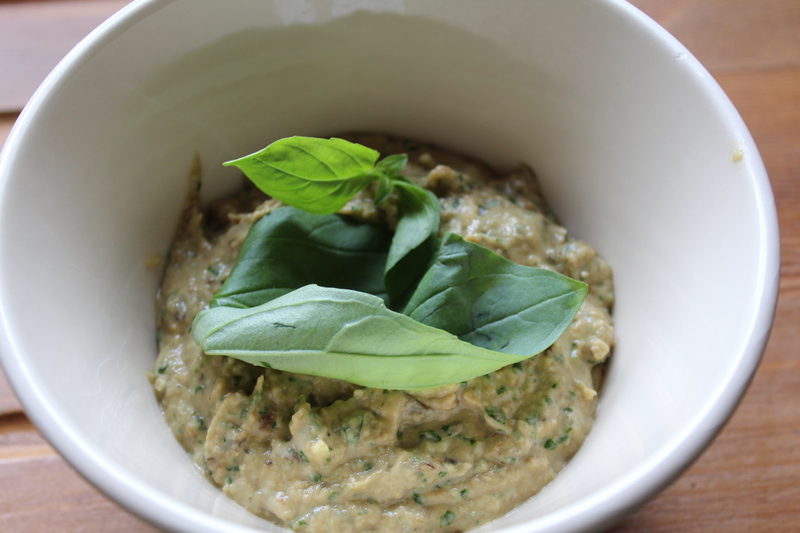 This entry was posted in Cooking and tagged Aubergine, Basil, Cooking, Dip, Pesto. Give them to me! Give them to me! ❤ aubergines. Prolific Knitter, Dyer, Gardener and Aga Lover. Mother to 3 boys. Blogs about her chaotic life! Colette O'Neill... Author, Publisher, photographer. Creator of Goddess Permaculture.